Cikgu Hamza on the Cover of 2010 January "Seni Beladiri" magazine! If you get this issue please let us know what the article says. We don't get Seni Beladiri in the USA. 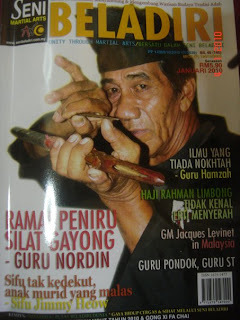 Also in this issue is an article by Rocky Twitchwell, a USA Silat Player. Happy New Year from USGF!